Animal-lovers have the opinion that a stinky dog is preferable to a stinky human. That distinct “dog smell” is redolent of fond memories and happy times with our beloved pets. Still, whether you bathe your dog because of health reasons or just for your olfactory satisfaction, a regular washing is generally a good idea. Do We Need to Wash Our Dogs? You’ll find articles and blogs that extol the virtues of washing while others criticize it. 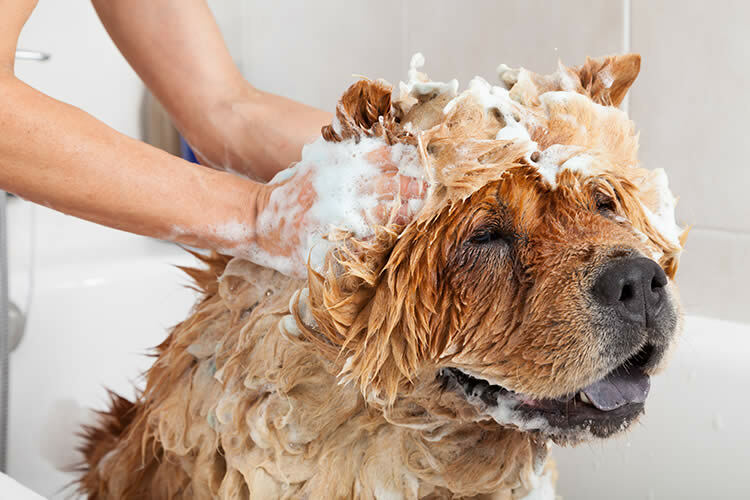 Even though many dog moms and dads may wash their fur-kids based solely on preference, there are situations that do require bathing. Dog shampoos used to be harsh and poor quality and thus people were advised to bathe their dogs only a few times per year. Because hygienic products for pets are now made with care, they can be used regularly without stripping natural oils from their skin. The same would be true for humans – if we only had abrasive products with which to clean our hair and skin, we wouldn’t be able to bathe too often either. If your dog spends a lot of time playing outside rolling on the ground, bathing them will get rid of the germs and tiny critters they may pick up. Not only is a build-up of germs not good for the household but it can also cause a skin imbalance. Because dogs have fur to hold onto germs, allergens, and other particles, they can develop a skin condition or skin allergies quickly. Smells due to lack of washing develop because of bacterial growth on the skin. The bacteria will produce waste – the source of the smell – and sometimes an imbalance which can cause skin issues. I had a foster dog whose skin condition was not alleviated through medical means and I declined to bathe him precisely because of the articles I read on the internet advising against it. He not only had a pungent smell but he also had a few crusty, yellowish formations on parts of his skin where he was also losing hair. Then, I decided to ignore the internet advice and bathe him three times per week with a gentle conditioning oatmeal shampoo. Not only did he start smelling much better but his crusty scabs cleared up too! So, go with your instinct. In this case, I clearly needed to wash my dog often. By contrast, I wash my small terrier once or twice per month. The determining factor for dogs – from their life spans to the decisions we make for them – are dependent on their breed. Some breeds are more likely to develop an unpleasant smell more rapidly than other breeds. Dirt and bacteria seem to cling to certain types of fur also. The breed also determines the dog’s activity level and thus determines how dirty the dog can get. Large breeds need a lot of exercise thus accumulating more dirt from outside elements than their smaller counterparts. Younger dogs are more playful and active than older dogs requiring them to be bathed more often. There is no one answer that fits every dog. Put concisely, some dogs need to be bathed often and some don’t. There are too many variables and you must go with your own best intuition. Factors include age, breed, size, type of fur, skin health, overall health, and level of aversion to grooming. Many of the ideas we have about dogs come from a bygone era when dogs were treated more like chattel than our beloved family members. Hence, the products that were made for dogs used substandard ingredients. Because our view of dogs has largely changed, the products made for dogs are often comparable to human-grade products. Bathing dogs is one such example of a point of view that has evolved for the better. Petful.com: 7 Myths About Dog Baths – Busted! Ruff Ideas: How Often Should You Bathe Your Dog? Are Dog Years a Myth?